Primes have been the subject of much attention ever since people began to study the properties of numbers - mathematicians, both professional and amateur, seem to find them fascinating. For instance Euclid showed that the primes go on for ever. However, some important properties of the primes are still not well understood. One example of this is the Riemann Hypothesis, which is the subject of Dan Rockmore's new book. and showed how the zeros of this function in the complex plane could be linked to the distribution of the primes. In 1896 Jacques Hadamard proved the prime number theorem, using the work of Riemann. But Riemann's hypothesis that the non-trivial zeros of the zeta function all had real part ½ remained unproven, as it does to this day. It is seen as such a puzzle that it has been chosen as one of the seven Millennium Prize problems by the Clay Mathematics institute, and $1000000 has been offered for its solution. 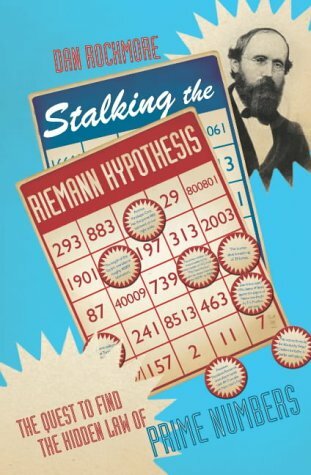 In the first part of Rockmore's book he discusses each of the main contributors to the subject, and shows how the different aspects of the Riemann hypothesis fit together. We see how this curious relationship arises between the theory of functions on the complex plane, and the algebraic behaviour of the natural numbers. As the book progresses we move out of an historical context towards current work on the subject, which makes up most of the second half of the book. Rockmore demonstrates how the Riemann hypothesis is related to some surprising areas of study, not just mathematics. In particular there is the subject of quantum chaos. Now quantum theory is linear, and to exhibit chaos a theory needs to be nonlinear, so this is a peculiar subject anyway, and the connection with an abstract question of number theory (which was the result of a conversation between mathematician Hugh Montgomery and physicist Freeman Dyson) only adds to the strangeness. I think that a reader shouldn't try too hard to follow exactly what is going on here, but should rather use Rockmore's descriptions to get an overall flavour for the work. The final chapter summarizes the current state of work in the area, but it is very short. For instance the work of de Branges is only mentioned briefly - I think Rockmore is keeping away from this controversy. I was a bit irritated at first by Rockmore's aversion to the use of equations in this book - he seems to act on the belief that each equation included halves a book's sales. However, I began to realise that this wasn't in fact so important, as if you want equations they are available elsewhere. (Although I'm still not convinced that there's any point in describing an equation in words rather than symbols.) Indeed Rockmore is very skillful in making mathematical material accessible to the non-technical reader, with good use of diagrams and graphs. For instance the introduction to the theory of functions of complex variables is well presented. Combining this with the biographical details of those working in the field, mathematics is thus presented as a subject the reader might like to study in more depth. Although the Riemann hypothesis might seem to be a minor problem in a remote area of mathematics , this book shows differently, indicating its relation to many other areas of mathematics and science. Indeed the second half of the book might be thought of as an overview of a fair amount of the mathematics of the last 50 years. As such it will appeal to a wide range of readership. It would suit the keen reader in the later years of school - it's hard to be precise about the level of knowledge required, as enthusiasm is probably more important - but it can also be read with enjoyment by experienced mathematicians. I would certainly recommend this book to anyone with an interest in mathematics and feel that maybe the eventual solution of the problem will come from someone who was inspired by this book.